At La Concha Renaissance Resort, our hot is your cool. Let the Caribbean rhythm fuel every minute of your stay at La Concha, a resort in the heart of Puerto Rico's hottest locale, Condado, San Juan. Live the buena vida and grab the moment with cool, San Juan beachside days and warm ocean breezes and hot nightlife. Hang out by lively pools or lounge under the wind-sculpted palm trees hugging the ocean. Enjoy exotic and local flavors at one of our chic Condado restaurants or sip a yummy island cocktail at our plush bar and lounge scene. Chill out by the sea by day and party by night. La Concha offers stylish amenities right in the heart of the entertainment capital of the Caribbean - the Condado district. Come see why San Juan's La Concha Resort is the place to be. Play at La Concha and get lucky! For an experience unlike any other casino, Casino del Mar at La Concha Resort features non stop - 24/7 - fun, excitement and sophistication under one roof. The Casino atmosphere is elegant, but the energy is spellbinding. Located in the open lobby of La Concha Resort, Casino Del Mar combines atmosphere with high-energy action designed to excite the senses. If you enjoy an uber-chic yet relaxed atmosphere while you play, Casino del Mar Resort combines cutting edge gaming with high-tech slot machines and card tables that satisfy high rollers and casual players alike. Pulsating above Casino del Mar's card tables, plasma screens broadcast everything from the biggest games to breaking news and more. Your favorite drinks are a grab away, at the tables and machines. When you open a Club Del Mar account, you'll receive points for play that qualify you for benefits, including room, food and beverages, and more. Sangrias in the sun? Pina coladas by the pool? Exotic food and some wine to unwind? La Concha Resort has become one of Puerto Rico's premier destinations for spectacular beaches, stunning views and impeccable dining experiences. Take in the tropical landscape, breathe the fresh salt air and experience something truly delish. Perla - Perla is a luxury seafood restaurant serving happening American cuisine. The wine cellar features more than 4,000 bottles with over 1,000 labels. There's a bottle of wine with your name on it! We have extensive by-the-glass offerings with 30 wines, all stored in climate-controlled wine preservation displays. 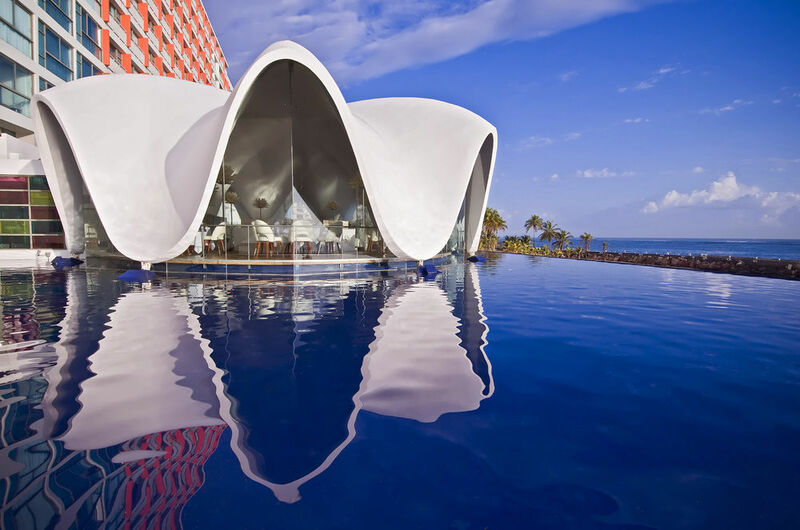 Located in the "concha" (the shell) and surrounded by a reflecting pool, the interior has chic furnishings with exotic materials. Delicias Restaurant - Wake up to a modern Puerto Rican breakfast at Delicias. Classic American recipes blend with our local favorites into a mouthwatering morning experience. Our buffet is among Puerto Rico's most distinctive, with fruits and other ingredients locally sourced. Our advice? Try our morning cocktails. At night, savor the taste of authentic Puerto Rican cuisine, and indulge in the creations of our Executive Chef, Erika Gómez. Solera - Heat up the night at Solera, La Concha's sophisticated open-air, multi-level terrace poolside restaurant. This San Juan restaurant serves deliciously light lunches, but when the sun fades over the horizon the tapas roll out of the kitchen and heat up the tables -- and the atmosphere. They're accompanied by pitchers of fresh, distinctive sangria and flavored mojitos to get your party started! Solera has restaurant-style seating as well as casual, tropical-style lounge areas for drinks and mingling. Sereno Beach Bar & Grill - Did you say sangria? We hear you! Located in the Ocean Tower and adjacent to our stunning infinity pool, La Concha's Sereno Bar & Grill serves icy cold sangria and an oceanfront San Juan dining experience you won't forget! Sereno Bar & Grill offers a variety of tempting entrees and enticing signature drinks, there's something perfect for every guest. It's a great place to relax -- cocktail in hand -- while enjoying the Caribbean breeze. Komakai - In Japanese, the word "Komakai" means "small and detailed". La Concha's Komakai Sushi Bar is aptly named for this Asian expression. Featuring a 13-seat sushi bar located right in our lobby, it's open nightly and features sushi, sashimi and several traditional and signature rolls, as well as some unique items. Serefina - This is the place to see and be seen! Serafina is a lively experience in Italian dining that has established its delicious brand across the globe, San Juan included. We invite you to sample our unique, inventive take on traditional Italian recipes, scrumptious weekend brunches and chic drinks - truly favoloso!